Spring is finally here and with the warm weather comes a whole load of great events to enjoy with your friends and family. Not only do we have tickets for great gigs but we also have fantastic West End theatre shows on offer too! 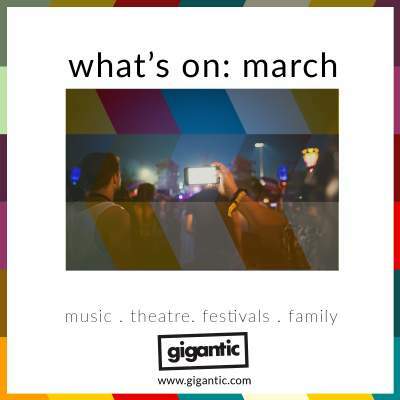 Make sure you’re in the know by checking out this blog of all the essential events taking place in March! ‘Starships’ singer Nicki Minaj is undoubtedly one of the biggest celebrities in the world right now! The Trinidadian-born American artist is often cited as the most influential female rapper of all time and her glittering career has seen her win many awards and sell over five million albums worldwide. Following the release of her best-selling album ‘Queen’ in 2018, she now commences The Nicki Wrld Tour on sale with Gigantic right now. Last year, multi-Grammy Award winning Canadian rapper Drake released his ground-breaking record ‘Scorpion’ which fused his passions for R&B with hip hop to take him to the top of the charts all around the world. Now, he kicks off The Assassination Vacation which takes him to some of the UK’s biggest stages including The O2 Arena in London. Make sure you grab your ticket as they are sure to sell out! Looking for something special? Family time doesn’t get any more magical than going to see a performance of The Wonderful World Of Disney On Ice. The dazzling show is hosted by Mickey Mouse and Minnie Mouse who take you down an inspiring walk along memory lane to be joined by such Disney favourites as Nemo and Marlin from Finding Dory, Snow White and the Seven Dwarfs, Buzz and Woody from Toy Story plus your favourite Disney Frozen sister’s Anna and Elsa. Love them or hate them, Sleaford Mods are back and ready to remind you just how naff BREXIT Britain really is. Having just dropped their brand-new LP ‘Eaton Alive’ on their very own Extreme Eating Records label, they kick off a 33-date tour with tickets on sale right now! We were very honoured when the terrible twosome came into the studio to perform for one very own Moonshine Sessions which you can find on the YouTube channel HERE. Sleaford Mods tickets are currently available. Adapted from the classic novel by Victor Hugo, Les Misérables is the stirring show which tells the tale of Jean Valjean as he tries to escape the guilt of his past and the prejudice laid upon the former convict at the time of revolutionary France. Recently adapted by the BBC plus made into a major movie release starring Hugh Jackman, Russell Crowe, and Anne Hathaway, the appeal of the timeless classic endures. Everyone is talking about The Cinematic Orchestra. Combing jazz and classical influences with cutting edge electronica has marked them as the critics favourite and earned them a dedicated following. This month sees the release of their latest LP ‘To Believe’ which they promote with a tour. Later in the year, you can also catch them at Bristol Sounds where they appear at Canons Marsh Amphitheatre on Sunday 30th of June. The Cinematic Orchestra tickets are currently available. With exciting rising to fever pitch for the upcoming live action Disney film, make sure you come see the dazzling Aladdin stage show at the magnificent Prince Edward Theatre in London. With mind-blowing special effects, over 350 extravagant costumes and an incredible cast singing all your favourite songs from the classic Disney film including ‘Friend Like Me’, ‘A Whole New World’ and ‘Arabian Nights’. Aladdin tickets are currently available.